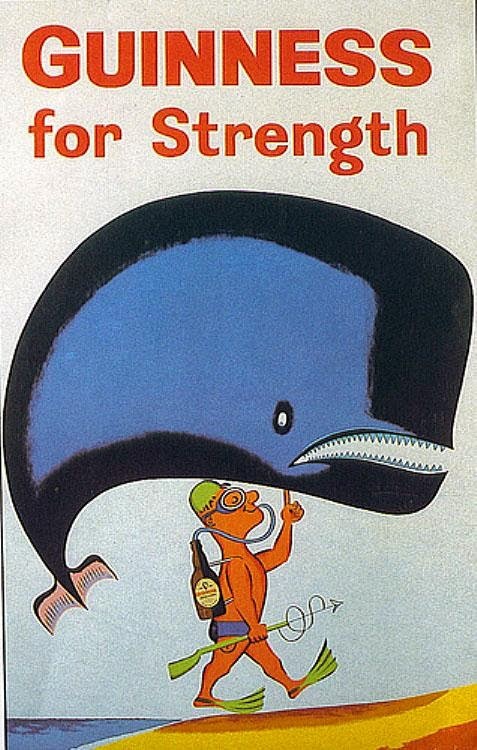 Diving can be thirsty work so here's another selection of ads for various beverages. 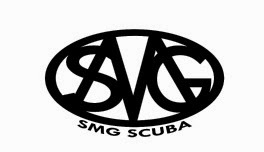 As always, the Art of Diving advises you to only consume alcohol after you've finished diving. 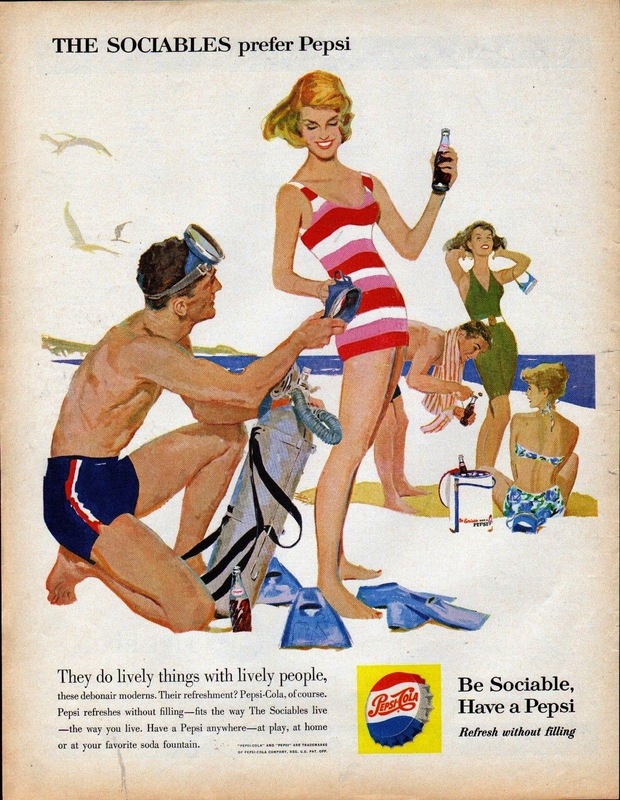 This Pepsi ad from 1960 was one of a long-running series featuring "The Sociables". 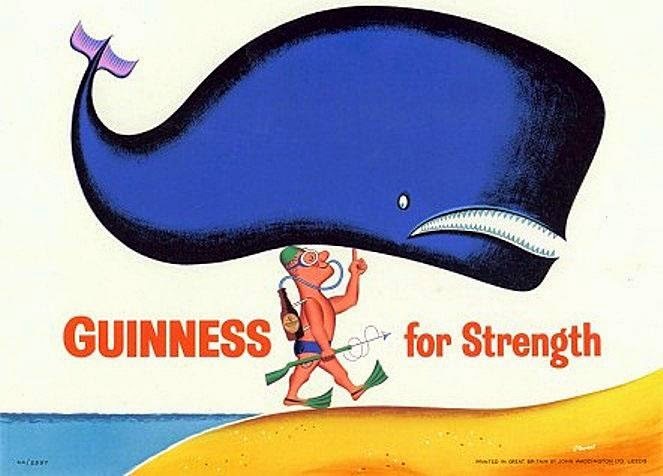 (Leif Peng of the Today's Inspiration blog has put together a nice collection of Pepsi ads here.) I don't know who the artist was for this one I'm afraid. (Click on image for larger version). 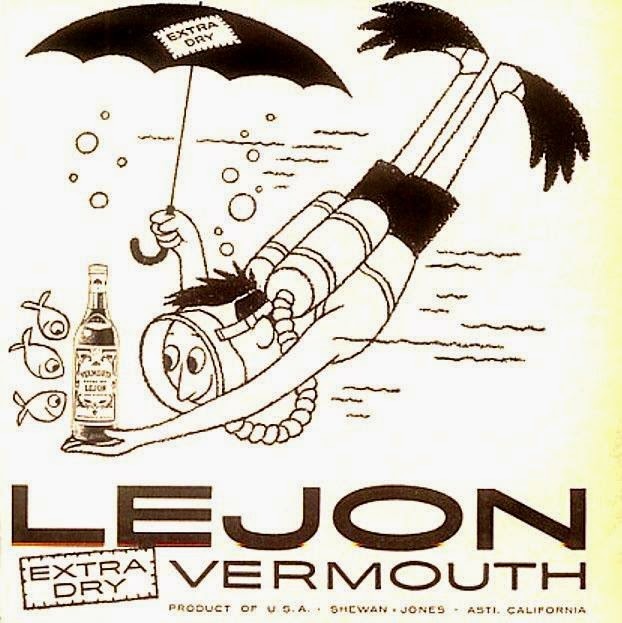 This ad for LeJon Vermouth dates from 1958. Dr Pepper used the same idea of the "drink-as-cylinder" in 1984. I wasn't sure whether or not to include this one but then I thought, "What's the worst that could happen?!" (Click on image for larger version). We finish with three very different 7-Up ads. 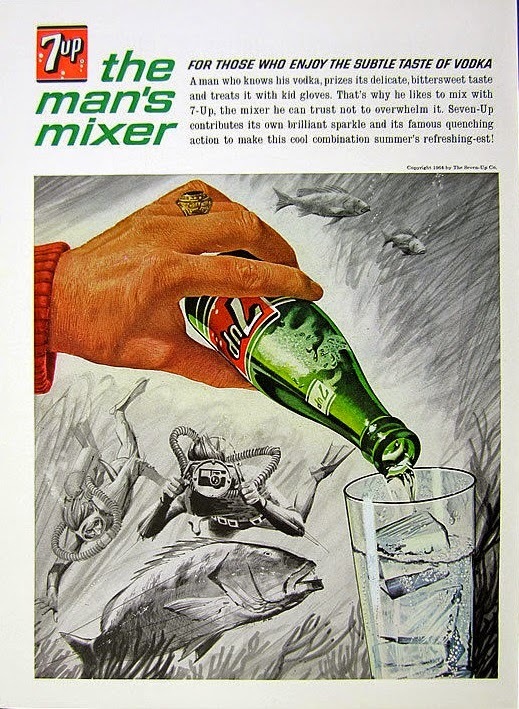 Sorry ladies but this one from 1964 says it's the man's mixer! This striking design is by Bob Peak who started his career in advertising, including work for Pepsi's "The Sociables" series. He's probably best known for his film posters which include Apocalypse Now, The Spy Who Loved Me, West Side Story, My Fair Lady, Excalibur, Rollerball and the first five Star Trek films. 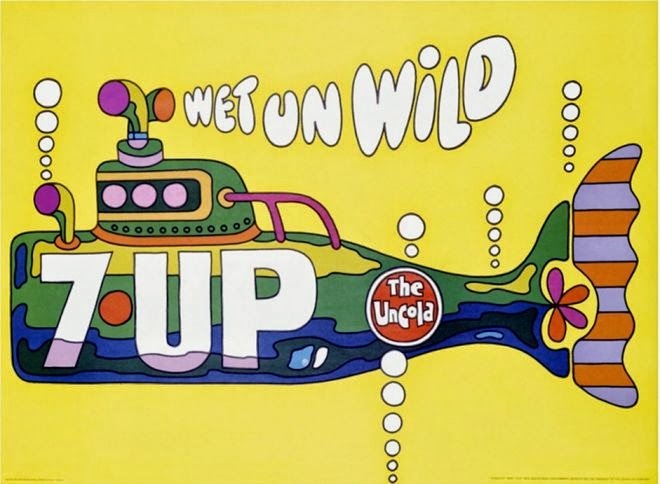 Finally we have this late 60s example which I would suggest was inspired by the design of The Beatles' Yellow Submarine. 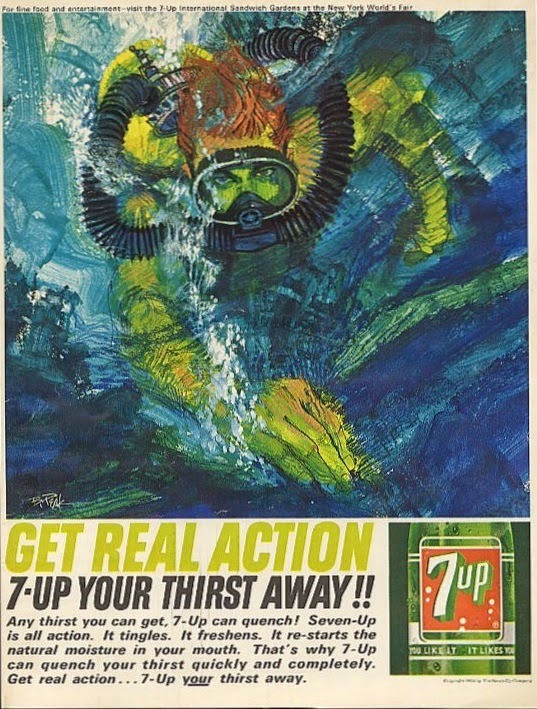 That "UnCola" 7-Up submarine is one of the most beautiful things I've ever seen, thanks for sharing it!